Every time I bake a batch of Peppery Bacon and Cheddar Scones – these magical clusters of heat, tang and smoke – Jeff and I have the same conversation: what makes them scones instead of biscuits? I mean, you definitely wouldn’t serve these with jam and clotted cream. These would not be the scone of choice for the pinkies-up crowd. However, scones and biscuits are more similar than you might think. Both can be sweet or savory, triangular or round. Both can contain cream or buttermilk or the same fats, including lard. Both are crusty with soft interiors. Even the mixing methods are the same. So, what’s the real difference? It’s in the ratios. Biscuits tend to have a ratio of 3:1:2 (3 parts flour, 1 part fat, 2 parts liquid), while scones usually have a ratio of 3:1:1. That seemingly slight difference is why biscuits are flaky and chewy, and scones are more spongy and crumbly. Since this recipe has a fluctuating amount of liquid (3/4 to 1 1/2 cups, depending on the weather), it could go either way. Use the minimum amount of liquid, and you’ll have scones. Use the max, and you’ll have biscuits. Either way, they make an appearance at our house once a week. I make a half-batch and skip the rolling pin in favor of patting down the dough and getting the scones into the oven. Each one brings a lot of personality to the plate, so you can eat them as-is and be perfectly satisfied, or you can split them and fill them with 1-egg omelets, sandwich meat or sliced tomatoes. Just make sure to eat them with your pinkies up. Preheat the oven to 400 degrees F. In a large bowl, stir together the flour, baking powder, salt and pepper. Cut in the butter with a pastry blender or two knives until the mixture is crumbly and studded with flour-butter bits the size of peas. Stir in the cheese until just blended. Add the green onions, bacon and 3/4 cup buttermilk. Mix just until the ingredients are incorporated. If dough is too dry to hold together, add the remaining buttermilk, 1 tablespoon at a time, until the dough can be formed into a ball. Stir as little as possible to ensure a light-textured scone. Place the dough on a lightly floured surface, and pat it into a ball. Using a well-floured rolling pin, flatten the dough into a circle about 8 inches wide and 1/2 inch thick. Cut the dough into 8 to 10 equal wedges. Whisk the egg and water together in a small bowl. Brush each wedge with the egg wash. Place the scones on an ungreased baking sheet, and bake for 18 to 20 minutes, or until golden brown and no longer sticky in the middle. Serve warm. These are my fantasy of what heaven would taste like if it were a baked good! I'm bookmarking this recipe immediately. Thanks!! IN the last month or so, I made some free form peppery cheddar biscuits and LOVED them….now I see this and know I need to revisit the recipe! Your scones look AMAZING!!!!! Did you get the ratios from that book you got for your birthday. That was the coolest book. Neither biscuits or scones are ever as good as the first three minutes they are out of the oven. Shut up! I just visited Rebecca's bakery (Rather Sweet) in Fredericksburg, TX and I ordered one of these scones! I ate the last one today and they were delish! These look great and now that I've tasted them, I know how good they are too. Oh my god, these look incredible. Jesus Ezra! – You've done it again! Another irresistable treat to grace the internet – I can't wait to give these a GO! Crap, where's the spell check when you ned it!? Thanks for clearing that up…can I have one now? 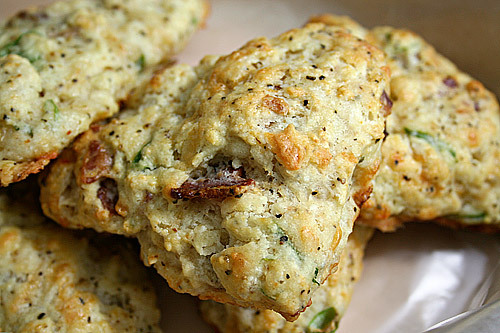 I really like the sound of savoury scones and these ones sound great! Such serious thoughts over scones and biscuits. :) I think if I were eating one of these, I 'd just be thinking: Damn, bacon is good. Pepper, bacon, cheddar – does it get any better??? These look sooooo delicious! Yum! Cream, bacon, cheese, and butter all in one sounds like my kind of scone. Agh these look so good! Interesting about the difference between scones and biscuits. Yes, I just have to say, yummy, Yummy, YUMMY! Breakfast all baked into one little triangle! Genius! Oh, and thank you so much for the nice things you said about my blog. It means a lot, coming from such a great blogger, such as yourself! Oh, and one more thing: Thanks for the little lesson on scones vs. biscuits. It's nice to learn a little something I never would have known. Holy Moses! I haven't made scones in forever, and now I have a new recipe to try out. Thanks so much! I made these yesterday with pepper jack cheese. They were really good on their own fresh out of the oven, but I fried a couple of eggs over easy and slapped them on top of the scones, they were heavenly! Great recipe. I love cheese scones. YUM. These look amazing. This is going on my list to try! Thanks! I love these! I made them, gosh, it must have been a year or two ago now! Thanks for the reminder to whip up another batch! Deee-lightful! I made these this morning and they were exactly what I was looking for. Cheers! Must say, my husband and I have the same discussion as you when it comes to making these "scones". He fights me on it and says they are biscuits, but I just sit there and say, no… the recipe says scones!. Either way. They are a delicious piece to any meal. I love including them into a roast beef dinner. Its a little pop of flavour to mix in with the rest of the wonderful flavours overcoming the dinner table. I made these this morning for my husband to have after his Saturday morning row with the NRC (Nashville Rowing Club). He was happily surprised. It was the first time I have made them and I suggested that he have an omelet over the top. He loved it and so did some of my children. Some wouldn't go near bread with what looked like it had hidden greens. Oh well, more for us :) I will, for sure, make them again. love these – in my house we call bacon "meat candy" — and i imagine these scones will be wonderful served with the batch of winter tomato soup I just made (onions, butter, tomatoes, tarragon) for tomorrow's post-brunch with in-laws – thanks. Made them… delicious! Thanks for the great recipe. They were quick and easy to make – nothing complicated about it. i just made these, and tried my first bite. They are delicious!!! thanks so much for sharing. I found this recipe through design crush.